The mLog 08 data logger family represents a comprehensive set of data logging devices. 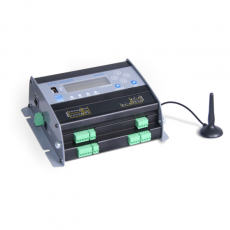 Rugged, stand alone, low power data logger with Built-in Web Server. 5 multi purpose, full isolated analog input channels, each allowing 1-3 separate voltages to be measured. Capable to connect most types of sensors like thermocouples, RTDs, thermistors, voltage, current, 4-20mA loops, resistance, bridges, strain gauges. High-precision differential inputs with 18-bit resolution.